As I shopped for perfumes in Italy this past autumn, I searched for Dsquared2 He Wood; the fact that He Wood wouldn’t be available in the U.S. till the spring of 2008 made The Search intense — I wanted to smell He Wood before it arrived in the States. On the last day of my trip, I found a bottle of He Wood in a Venetian perfume shop and asked the shop owner if she had any samples of the fragrance. “No.” she said. I asked if there was a tester bottle. Flippantly, she explained: “It’s a new scent, Sir, so, no, no tester has been opened yet! It’s new!” Her “logic” was lost on me, and I left Venice and returned to the U.S. not knowing if He Wood was good, bad or boring. In December, I discovered that He Wood is available in Canada, so off I went to finally sniff it. Little did I know my shopping experience at a Canadian department store would make my ‘run-in’ with a merchant of Venice seem quaint by comparison. Upon entering the perfume section of the (not-to-be-named) British Columbia department store, a friend and I stopped to smell a few Frederic Malle scents. As I picked up a bottle of Angéliques sous la pluie, a nearby male sales clerk, his voice frantic, “whispered” to another sales person: “They’re SMELLING the perfumes!” I soon learned that the precious Frederic Malles were NOT to be handled unless a “Malle expert” was standing right next to you: monitoring, advising. (I chuckled.) As I moved to the main perfume counter (that did stock a good range of hard-to-find niche brands), I seemed to be “scolded” every time I dared to pick up a perfume bottle. As I would touch a bottle, a sales person would swoop in and grab the bottle from me, spray the scent on a card, and hand me the card. When I finally found He Wood, tested it, and decided to buy a bottle, more “fun” ensued — the bottle size I wanted was not on the main floor but in the storage rooms down in the belly of the building. It took some time before one of the many perfume sales people decided to schlep downstairs and get me a 50 ml bottle. As I was paying for my bottle of He Wood, I brushed against a rack of $12.50 quilted-vinyl purses; the woman ringing up my purchase stopped the transaction, went over to the rack of cheap purses and rearranged them and, with annoyance, said: “You moved the purses…they have to be evenly spaced.” (I was no longer chuckling.) Final insult: I was told there were no samples of any of the scents on the perfume counters (“We gave them all away at Christmas!”), a claim I didn’t believe, especially after seeing one drawer opened — revealing scads of sample cards. I may go into that store again: IF it awards me a prize whereby I’m flown to Paris to meet Francis Kurkdjian who will present me with bottles of all his creations, and sit and chat with me for an afternoon, and then concoct a personalized perfume for me: Eau de Raconteur™. I’ll dispense with all background info on Dsquared2 and its founders, Dean and Dan Caten, because the Dsquared2 website is pretty thorough. I will say Dean and Dan are from Canada and wanted to evoke a Canadian woodland with their first men’s perfume. He Wood, designed by perfumer Daphne Bugey, is built around an outdoor theme; there’s Air (white fir, musk, vegetal amber), Water (violet leaf, violet flower, transparent aquatic accord) and Wood (vetiver, cedar wood). The first seconds of He Wood are neither pleasant nor useful, unless you have a wound to attend to, mosquito bites on your arms or, perhaps, a nurse fetish — the first thing I smell is the aroma of: rubbing alcohol. After that nose-tingling blast of isopropyl alcohol wears off, I smell violet leaf, a beautiful violet flower note, mild vetiver and (what I assume to be) the transparent aquatic accord. If you have read many of my reviews, you know I usually hate aquatic notes in scents: marine notes, “waterfall” notes, “raindrop” notes, but the aquatic accord in He Wood is smooth, calming and barely there. I have always loved violet leaf and violet flower notes in fragrances, but those notes usually vanish quickly; He Wood produces a lovely blend of violet leaves and flowers and holds on to that accord for almost the entire life of the fragrance on my skin. He Wood also produces aromas that remind me of mid-stage Dior Fahrenheit, and non-powdery mimosa blossoms. He Wood does not attempt to create “real” woodland scents in a bottle — there’s no damp moss or raw wood accords, no powerful “green” or “dirt” notes. He Wood’s woodland is dreamlike, impressionistic — all aromas are pale, blurred, and watery. He Wood, no matter its name, is not about pungent wood — the fir accord and cedar wood are barely noticeable on my skin. He Wood provides a new take on “wood” — its smooth, bleached woods float on sweet, cool, lightly flower-scented water. He Wood does not provide moments of shock or awe; its notes blend together seamlessly. He Wood has excellent lasting power and is great for days when you want to smell good but don’t want others to notice the fragrance you are wearing (unless they get really close); it can easily be worn by women. Thanks G…if I worked in that fragrance department MAJOR changes would have to take place! I really don't have anything like He Wood in my perfume collection — thus the purchase. It is a perfect scent for spring so they chose a great time to release it in the U.S. Thank you Kevin for this one. Living in CZ for a couple of years already has been an overal similar experience shoppingwise, like you experienced it in Venice and worse.. ?Canada?. Wanting to buy something luxurious like a perfume or e.g. Chanel cosmetics, is a true agony and the sales people look as if they want every client to leave the store asap. By now I visit all the companies' websites first for good information, before I make any purchase. Let me get this straight: You actually *dared* ask for a sample of something that almost no one had ever smelled? Then you had the nerve to SMELL THE PERFUMES… BY YOURSELF?!? LOL! God, I really do hate the SAs sometimes! The perfume industry would go the way of the dodo if it were left up to their interpersonal skills! I guess I just don't have that “help me, I'm a sheep and don't know what I like” look on my face that they are trained to love. Maybe we should have business cards printed up that say “Hi, my name is ____. I have money, I would like to spend it on perfume. If you leave me alone and let me sniff, perhaps you will get a commission today. I'll let you know if I have any questions. Thank you!” Sheesh! Great review – the He Wood (funny name aside) sounds really nice, and glad it's not powdery, because I thought it might be with the violets. Will have to look for it. Amazing. You do have to wonder how this sort of behavior is rationalized. I worked in retail for many years (not in fragrance, tho'), and find this kind of thing incomprehensible. The reaction to your having jostled the purses was unbelievable. I like Rose's idea for the business cards, although I imagine it would elicit mostly blank stares. Nice review, though! He Wood sounds perfect for violet lovers. Marianne: GOOD IDEA to do some “research” before hitting the shops…then you can probably tell those sales people a thing or two about the perfume they do NOT know. I am enjoying He Wood…thank you. Rose: yes, the THEY ARE SMELLING THE PERFUMES line is the funniest of all isn't it? What else am I supposed to be doing!? There are LOTS of people who show up at perfume counters and say: “What should I buy?” and DO let themselves be guided by a sales person…this always “shocks” me! L: it was HARD to hand over the money believe me. Unlike lucky you, I have few places where I can sniff in peace and at my own pace…. HATEFUL! Exist: the purses were almost the last straw! Hilarious! I guess it is nore important for the store to be orderly than for purchases to be made? It's hard for me to believe that the SAs are not being driven by some overly orderly manager type who dings them for bags askew and testers depleted. Z: I hope the manager DINGED the woman who was ringing me up! HA! Moongrrl: well I DID torture them, especially after I realized they hated for me to pick up bottles willy-nilly…I was picking up things I had NO interest in just to rile them up. Worship the perfume from afar? I can't imagine asking someone else what they think I should wear (perfume, clothes, anything!) – not even my husband! You know, I always think of things I would say in a situation like that, but I'm shell-shocked when it happens to me and say nothing at all! good for you. I might have “accidentally” bumped every rack of everything I could bump into on the way out- and on the way back in the next day when I returned the fragrance…. Thank you for the review! Now I'll have to find somewhere to try this –not easy in the midwest, I'm thinking. I had a similar experience at the large mall department store near my home –similarly bad, at least. Which strikes me oddly, as I am twenty, and female, and so you would think they'd be looking to convert me to the faith young –but evidentially I did not look like a serious purchaser because *no* sales associate would speak to me. Not one. They offered tepid smiles, rushed to speak to older women (chased them down in the blasted aisles, which could get quite entertaining) and were generally obsequious to other customers, but I stood at the Guerlain corner of a counter for at least ten minutes attempting to get noticed. No luck. Ironically, I was carrying a fifty dollar gift card to the store in my purse, and would have spent on the spot if I'd gotten a moment's worth of attention. I suppose I'll be going back to the store to request they cash the certificate –I certainly won't be purchasing anything there now, if ever. Predictably, the nice folks at Sephora were a lot more accommodating. I assume this department store had the initials HR – our HR in Calgary was not as bad, but the Jo Malone rep was fairly holier-than-thou. One time I heard her say fairly audibly to another SA “Don't bother with HER. She never buys anything here.” Yeah, lady, you're right – I can get anything in this store for half the price on the internet, and nobody requires me to praise some lame recent release from whatever line the rep is hawking that day. I do hope that all the HRs start carrying Frederic Malle, though, we can't just baby the Vancouverites! Erin: Vancouverites ARE spoiled..but this is the first time I've EVER been treated in such a way in a store anywhere in Canada. Another interesting thing I overheard recently…a customer told a dept. store rep she bought a Shiseido scent at a discount store online and the rep said: “Then you are NOT getting the real Shiseido…it's a fake for sure!” The poor customer was so upset…”But it smells the same!” HA! What ya gonna do? I think I may have mentioned this somewhere else on this site, but buying (or even considering) looking at perfumes at the Dillard's in town can be a task because for some strange reason that I can't understand, young women behind the counter CANNOT STAND ME. I'm not mean, I'm not rude, and I don't smell of B.O. I'm always so sweet to them, and it KILLS them that they can't say anything crass or rude back. I can't help but secretly smirk inside. There was only one that made me fly off the handle. The woman that was working there before them was actually INCREDIBLY rude to me, and I definitely let it fly that day! I was asking to try out some of the Chanel fragrances, and in her thick Russian accent she asked me crass and incredibly rude manner, “Do you even KNOW what Chanel is?” In more ways than one I pretty much let the woman know that I knew what Chanel was, and some other choice words. Thankfully the manager was there and heard everything that went on, and she was let go two weeks later. Kevin, I'm disappointed: that store didn't deserve your business nor the SAs the commission. You'll be doing the management a favor if you submit a complaint even now; they should be grateful for your effort to help them improve their business. The purse incident was over the top — and interrupting the transaction to boot! So much for Canadian hospitality. You must have been DESPERATE for the He Wood! I'm also thrilled that you could at least TOLERATE the aquatic accord! I've had my eye on this for a little while and can't wait till spring, though I was hoping for perhaps a bit more cedar & vetiver. The handling of the violet leaf sounds delicious. I'm also very smitten with the bottle. Your description of it as an impressionistic take on woods for some reason made me think of it as the scent of the woods in the “fox wedding” scene in Kurosawa's “Dreams” — for what it's worth. Great review. And that's why I spend so much money on samples from websites. How disappointing that you were treated so shabbily in my hometown of all places! We're not all like that I promise! If the store you visited has the HR initials (and I'm pretty sure it is), then double-shame! I love the selection they have there, but do not like visiting the counter because of the army of SA's standing behind it watching your every move. Too bad about FM though – my experience with the sales manager for that section was lovely. Maybe she was just happy to chat with someone who had heard of the line, but she spent lots of time showing me perfumes, explaining the notes and telling me about her training session with Mr. Malle himself. I'm sorry you did not have a similar experience. Booooo! on those rude salespeople. If you're still in Vancouver, you can always visit the fabulous Naz at the Perfume Shoppe. She will chat with you & will let you snuffle to your heart's content. Buffy: How terrible! One can only wonder what type of work environment produces such meanness. Joe: what a great visual for He Wood: the fox wedding. 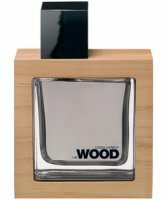 With a name like He Wood you'd think the fragrance would be really masculine and really woody, not the case. (If you really “can't wait till spring” drop me a line at gmail). Vancouver is one of the most gracious and beautiful cities…maybe the sales people were imported!? QC: I've been taking advice from women my whole life…for this particular store I'd love to ride a HORSE to the door and slash my riding crop thru the air as I tackle the perfume department. Kevin, let me guess. This was the Holt Renfrew in Vancouver, no? One of my friends told me that you know you're finally grown up when the sales staff at Holt Renfrew doesn't treat you like a hobo… a true attest to what a**holes they really are. Glad you liked Dsq after having gone through hoops to just smell it. I'm craving violets myself these days and was actually considering a FB of either Eau de Cartier or YSL L'Homme. Was wondering how EdC compares to Dsq, could you give me any pointers, per favore? Ah, so it appears Dsq ISN'T the dark, incensey fragrance you smelled on many Italian people…have you figured out which one it was? Or do we need to do some sleuthing? Nam: so being treated like a non-grown-up/hobo in the store is the equivalent of being carded at a liquor store: I'll take it as a compliment then. I'm still a “sweet young thing!' then! HA! PS: you know a friend of mine who worked in retail for many years always tells me a rude sales staff says more about the CLIENTELE than the sales staff! “If you have demanding customers, you will have a defensive, rude staff.” I really don't buy that…especially with all the kind people of Vancouver…the others in the store were being treated just like me. Dusan: Happy 2008 to you and Meda…I wish deare Meda had been with me at the store…her pop-eyed, “I'm WORTH it!” Pekingese attitude was what I needed, huh? She would have dispatched those rude people with one head-toss and under-the-breath growl! I like He Wood better than EdC or L'Homme, and if you crave violets do give it a try before buying anything else with a “violet” vibe. WIth a name like He Wood I was thinking “caveman”/”woodpile”…”ME! MAN! !” Just the opposite! I still have not come across the scent of that elusive fragrance from the streets of Padova…I pray I come across it SOMEwhere. Here's to a healthy and joyous new year! Dusan: FIRST: apologies to Meda for calling HIM a SHE!!!!! Unforgiveable! Next time please mention the name of the store…it's obviously Holt Renfrew. They don't deserve your discretion. Up until a few years ago HR was the only outlet for some of my favourite fragrances. Thank goodness Sephora came along with their friendly, knowledgeable staff. I avoid HR if I can. When I am forced to buy there I am always firm and direct with the staff. I do not put up with their attitude. Remember, you are the one with the credit card! the local dillards to me always keeps their bottle completely under the counter. The only ones you'll be free to try on your own are the most recent releases. I hate this because though have to ask to smell something, and once you do, they expect you to buy something, and get all cranky when you don't. I guess it's a pretty common thing to be treated like you're unworthy at the fragrance counters. Luckily, at the Macy*s near me, there is this OMG SO NICE LADY who I love it when she helps me because she's really knowledgable about the perfumes, and she's really nice too! Thank you for the heartiest laugh I've had all day! I have several friends who are perfume SA's and to a person they all seem to 1) hate their job and 2) hatehateHATE their customers! I think hating the job comes first they loathe their managers, who do seem kind of stupid – but there's an odd snobbery that seems to be a requirement for the job. My favorite was the gorgeous tran who used to TERRORIZE every other matron who came into the store. Oddly enough, they seemed to love it! Btw – what do you ride? I ride a gorgeous custom-painted, slammed Road King. Not to the perfumeries, alas – there's nowhere to safely park my baby boy. the nerve of those people !!!! but by far not the worst i have heard or seen , while living in milan and studying fashion design i had many classmates from all over the world , one day this indonesian boy , an american girl named channele and myself went shopping at a famous street near duomo and what was supposed to be a quiet and nice afternoon turned out to be the worst nightmare for any shopaholic ,ok to make it as short as possible i'll just say we were looking around enjoying ourselves , all the time being ignored by the sales people which is actually nice when you just want to look , then channele sees this jacket and starts looking around for some help we waited for some minutes just to end up giving up and do the size searching alone , turns out the only medium size was worn by one of the stores mannequin , channele taught easy to just grab it since she was definitely going to buy it ( as far i am concerned this was a sensible idea because the sales people were just too busy ) , NOW here is the good part all of a sudden the manager comes out from the back of the stores and starts YELLING at channele in italian about how she should have some manners and other nastiness i shall not say ( everyone including the staff was looking like she just lost her mind ) , to say we were surprised at this burst would be to put it mildly , then the indonesian guy just tells channele ” lets go this is stupid ” , well the next just happens in a flash the manager in her poor english i am sure understands that SHE is stupid and starts howling at them with all the rage that a woman 4'8 tall is capable , the indonesian guy and channele made a run for the exit (cursing, laughing and yelling back in what i think was a mix of fear and excitement ) while i just watch it all go in slow motion , well BELIEVE IT or not she RAN after them and chase them for about 100 meters to grab the guy by the collar and yell some more , i of course was following from behind when i see she is getting violent , i start calling for the police and then i guess she comes to her sense and desist . WHAT was she thinking ,hehehehehehehe SCARY!!!!!!!! Paulina: OK…I admit defeat, your story has ALL OUR STORIES beat! Certainly that was one shopping spree you'll never forget. Or did you find it just something generic airy-woody mainstream perfume? Kevin, yes, I was asking you. Thank you very much for the answer. I love He Wood. Maybe more than any other male fragrance I tried so far. As for dealing with the snooty SA's (I'd say that maybe half the perfume floor staff fall into that category), I just look them straight in the eye and say (with the following attitude breakdown: topnote – friendly; heartnote – polite; basenote – do not f**k with me), “I'm just going to try out a few of these fragrances. Is that all right with you?”. This usually gets me at least left alone with the bottles; the snoots NEVER dole out samples (to me anyway). The very first time I shopped there, I was pretty intimidated, but the woman that helped me was super sweet, and has continued to be so ever since. I also remind myself that although that store caters to an upscale crowd, and the salespeople try to present that image, too… They're still just worker-bees like many of us. Your experience there was clearly a bad and inexcusable one, but I wouldn't paint the store's entire staff with the same brush. Oh, and WHERE is there a Sephora in Vancouver? There seemed to be several sweet sales people at the department store but they simply smiled at me and let the Gorgons get on with torturing me. There was one woman in particular with an “up-do” and cool glasses that looked knowingly at me (and pityingly) as I was being “helped.” I certainly didn't mean to imply all staff were mean…I just had NO luck that day! Yeah, I wouldn't be one bit surprised if the “Gorgons” are senior staff or something because, not to be age-ist or anything, the ones that I've always found snippy and overly attitudinal seem to be a bit older than some of the other, nicer ones. Rene in the FM dept, however, would be an exception to that. She's really great if you ever get a chance to go in and talk Malle. Hey, I tried the Dsquared2 He Wood last week! The company gave us each a 30 ml bottle and I really, really like it. I agree with your description of the woods being a dreamscape. I also tried the She Wood, but sadly, didn't love it as much as the men's. It's coming to Nordstrom soon… I'll post the date when I look over my paperwork. I think it will do very well. Hey, I got a sample of this at Nordstrom today – they were out of Women but I don't really care – I'll try it another time. I don't like “water” either but I do find it quite OK in this so far – I have not done a liberal spritz yet but I like that it smells like the rainy outdoors without that chokey aquatic weird thing happening. Why is everyone who posted on this coming up as anonymous? I smelled he wood. The name is hilarious, though no one else seems to think like I do…and the bottle’s great, but it smells like straight sawdust to me. No violets, no water, just lumber mill. I guess that would fit in with the pacific northwest, but to wear it I’d have to be wearing a red flannel shirt and boots, and be named Bruce. I haven’t smelled she wood yet. Is it like a lumber mill with lots of butterflies caught in the machinery? Thank you so much for this review! I’m pretty new to perfumes and bought a few that I liked at first but grew tired of quickly. He Wood however .. wow .. every time I spray it on I can’t stop smelling myself. I love how it’s pretty subdued, unobtrusive, yet very different (to my nose, at least), remarkable and fresh but with a solid base ..
How come this reminds me of Prada Infusion d’Homme? I know cedar is a common threads all my favourite scents together. But it can’t just be that, can it?